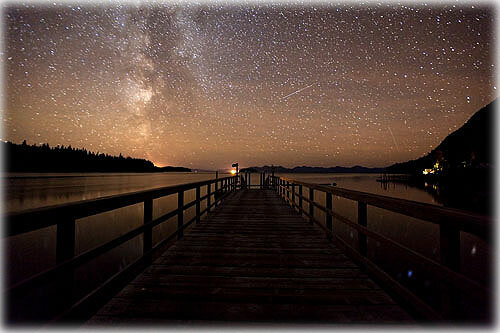 The Milky Way galaxy as viewed off the end of the pier at Saltery Lodge. It was pitch black out when this photo was taken. It was about a 60 second exposure. Note there are a few shooting stars captured as well. Ketchikan: House Fire: Troopers "Heroes" says Fire Chief - Chief Dave Hull of the North Tongass Volunteer Fire Department said fire caused about $50,000 to $75,000 damage to a house at 89 Jenck Road, belonging to Frank and Melissa Garrison and sent the woman and a trooper to Ketchikan General Hospital with smoke inhalation. A child in the house at the time of the fire was uninjured said Hull. Frank. Garrison was out of town. Units from North Tongass Volunteer Fire Department and Alaska State Troopers responded to the scene. The first arriving Alaska State Troopers were the heroes of incident said Hull. at 89 Jenck Road, belonging to Frank and Melissa Garrison. The original call came in to Ketchikan Police Department Dispatch late Thursday evening as an open line 911 call that was immediately transferred over to Alaska State Troopers dispatch. First arriving Alaska State Troopers, Zach Huckstep and Jack LaBlanc, believed the call to be a possible domestic violence call due to the way the call came in said Chief Hull. 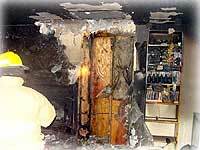 After discovering the true nature of the call the officers immediately asked for fire and EMS response. Trooper Huckstep broke the door down and was able to pull the unconscious woman from the residence and then reentered the house to find and bring out the baby said Hull. NTVFD fire and EMS were toned out at 2320 to respond to the house fire and later (at 2324) was updated with the report of an unresponsive female said Hull. Hull said the troopers began breathing for the woman with a bag-valve-mask device when NTVFD personnel, FF/EMT 2 Jessie Hook, arrived on scene. Hull said the baby was taken to a neighbor and put in their care. M-8 and E-8 arrived on scene and the woman was immediately put into M-8 and transported to Ketchikan General Hospital's Emergency Room. Trooper Huckstep was transported in stable condition to the ER by NTVFD personnel with smoke inhalation and increasing hoarseness and coughing said Hull. Ketchikan: Alaskan Lighthouses Lit The Way; For Safer Southeast Maritime Travel By DAVE KIFFER - There are few places darker than the waters of Alaska on overcast nights. Over the centuries, hundreds of ships and thousands of mariners have come to grief on the rugged, unforgiving coast line. 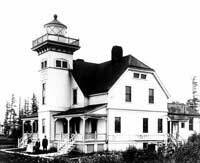 The first two lighthouses to be built were Five Fingers, at the confluence of Frederick Sound and Stephens Passage south of Juneau and Sentinel Island just north of Juneau in Lynn Canal.. Both lighthouses were "lit" on March 1, 1902. In some places, like Wrangell and Sergius narrows, dozens of blinking aids to navigation now light the way like Christmas bulbs strung to lead ships to safety. But in other areas, like the wide expanses of Clarence or Chatham straits, you can sail dozens of miles without seeing a single light. Except for the lighthouses, the beacons of safety that the United States finally established in Alaska in the early 1900s, after the unregulated maritime chaos of the Klondike Gold Rush of 1897-99 led to hundreds of marine accidents in Alaska in a two-year period. The first "lighthouse" in Alaska was in Sitka in 1834, according to Shannon Lowry in her excellent 1992 book, "Northern Lights: Tales of Alaska's Lighthouses and Their Keepers." "The Russian American Company suffered terrible losses of ships and men on the perilous voyages from Siberia to its headquarters, eventually established at Sitka in Southeastern Alaska," Lowry wrote. "With the exception of a small whale-oil lantern placed in the cupola atop Baranof's Castle at Sitka around 1834, toward the end of Russian rule, no lights illuminated the brutal shores of Alaska." Not much changed when American took control of the territory in 1867. That year George Davidson of the United States Coastal Survey made an extensive survey of the Alaskan coast and recommended, in 1869, that two lighthouses be built in Sitka, two more near Kodiak, and two at Dutch Harbor in the Aleutians. In his report to President Andrew Johnson, he noted that hundreds of ships had gone aground in Alaskan waters. He also recommended that hundreds of other buoys, lights and other markers be deployed along the coast.